Yemeni President Ali Abdullah Saleh vowed on Friday to stay on and defend his people “by all means” after the US insisted he agree to a transition plan “now” and end months of political violence. “We will defend ourselves with all our forces and by all means,” he told large crowds of loyalists in the capital where tens of thousands of opposition activists also rallied to demand his immediate ouster. Saleh made no direct reference to the United States, but the remarks came a day after Washington, his long-time backer, asked him to sign “now” a Gulf-brokered transition plan that would see him out of power within a month. His ritual Friday speech came as suspected Al-Qaeda men ambushed a military vehicle and killed all five troops onboard in the province of Marib, east of Sanaa, a security official said. In the capital, security forces massed ahead of the rival demonstrations for and against Saleh, witnesses said adding that there were no immediate reports of clashes. Around 175 people have been killed in the anti-government protests in the past three months. Heavily armed Republican Guards and military vehicles were seen reinforcing troops already guarding the presidential palace, radio station and other key state buildings in Sanaa, an AFP correspondent said. Pro-opposition troops led by dissident General Ali Mohsen al-Ahmar tightened a cordon around University Square, dubbed “Change Square,” to protect protesters from any attack by Saleh loyalists, witnesses said. Tension escalated after a heavy crackdown since Wednesday when a total of 19 people were killed by troops and gunmen loyal to Saleh in several parts of the country, including the city of Taez, Yemen’s second largest. On Thursday night, Ahmar issued a statement condemning what he called the “brutal and barbaric” repression and called on government troops to disobey orders and refrain from firing on protesters. 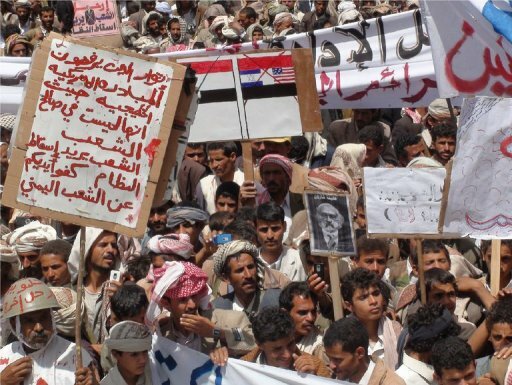 The escalation of political violence came after impoverished Yemen’s wealthy Gulf Arab neighbours urged all sides in Yemen to sign a transition plan aimed at ending the bloodshed. Saleh has stalled by refusing to sign in his capacity as president, insisting on endorsing the agreement only as leader of the ruling General People’s Congress, contrary to the demands of the opposition. He says that under the constitution he should serve out his current term of office, which expires in 2013. The Gulf Cooperation Council plan proposes the formation of a government of national unity, Saleh transferring power to his vice president, and an end to the deadly protests. The president would submit his resignation to parliament within 30 days, to be followed two months later by a presidential election. He and his top aides would be granted immunity from prosecution. Human Rights Watch called for the immunity clause to be removed to allow Saleh and his aides to be tried for attacks against civilians. “Yemeni courts and foreign governments will still be obligated to hold Saleh to account for the attacks even if an immunity deal is signed,” the New York-based watchdog said.